I'm back from the holiday break and ready for more Crossing Crossovers! 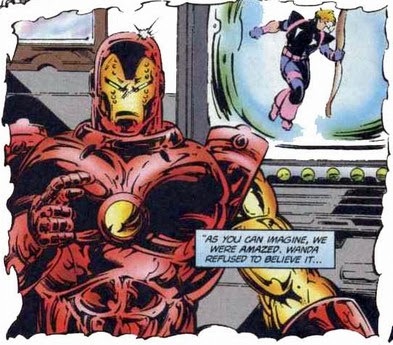 I feel like even the somewhat casual Marvel fans basically knows who War Machine is, but just in case you weren't paying attention in those Iron Man movies, War Machine is James Rhodes, a long-time friend of Iron Man who occasionally filled in as Iron Man when Tony Stark had personal problems, and is eventually given his own suit of armor (The "War Machine" armor, naturally), and receives his own solo series in 1994, at the tail end of the comics boom. At this point in his series, he's on his own, and somewhat estranged from Tony Stark. He also has crazy new alien armor. The Eidolon Warware in action. We begin our story with an outrageous steroid monster with outrageous 80's hair smashing up cars. His destruction affects Jim Rhodes, who is driving back from Canada with a mystery woman named "Skye" and something called the Eidolon Warware, an alien costume that he found in Canada. After some cryptic hints, the two get caught in traffic, and notice Buicks flying around. War Machine puts on the armor to save some bystanders. He finds the steroided up guy and defeats him easily, using "Alpha Waves" to put the man in a "fugue shut-down." Jim heads back to the Worldwatch office, where he hides his new alien armor from his associates. While at the office, U.S. Agent drops by, and gets him up to speed on recent events in Force Works. Jim meets with Erica Sondheim, who confirms her findings that Hawkeye is the killer. Jim takes the tape back to Worldwatch, where one of his tech guys says that only the greatest photoshop users of all could have managed to perfectly alter the light and shadow in the room, pixel by pixel, and lists Reed Richards and Tony Stark as possible candidates. I'll bet they win every Boggle tournament, too. 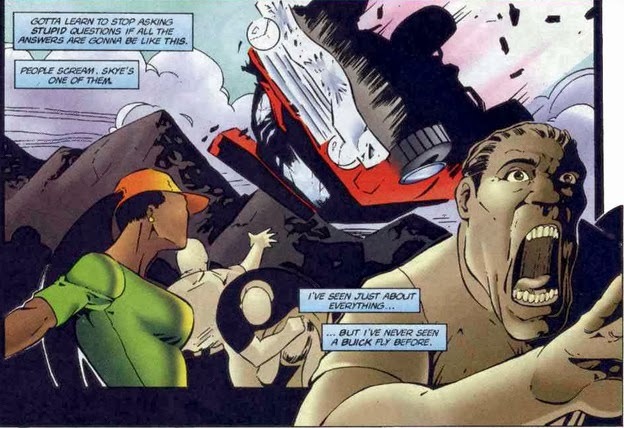 That's supposed to be a terrified bystander, not the sandman turning solid and melting. At Force Works HQ, U.S. Agent attempts to move Hawkeye, but Cybermancer tries to stop him. She seems to have the situation in hand when War Machine appears and blasts her. The two heroes and Hawkeye make their way to a hex ship and make good their escape. Hawkeye finally recovers from his injuries and asks what's going on. Agent and War Machine tell him they'll tell him as soon as they figure it out. The idea of a crossover like this is that it's supposed to boost sales for low priority titles, as readers will want to follow the story across multiple books. This issue does a reasonable job with this, but it feels like the first time in about a year that anybody's paid any attention to the story going on in War Machine. War Machine apparently lost his armor back in issue #17, and quickly found a replacement, instead of just... not having a comic book any more. While the book does move the Crossing plot a step forward, the flip side is that I should walk away liking Jim Rhodes or knowing more about his character or something, and it's just not there. 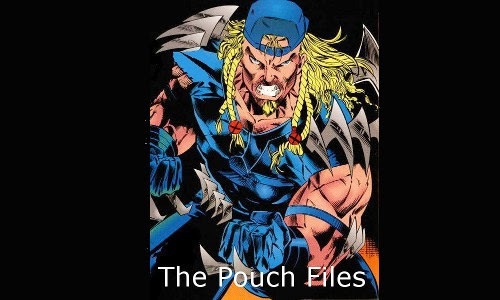 As maligned as Spider-Man's non-stop introspection and Claremont's narration were by 1994, both succeed in telling us a lot about the character. Conversely, I feel like I don't know anything about Rhodes at the end of this issue, despite a running monologue. On top of that I have absolutely no idea who his supporting cast is, outside of those he's borrowing from Iron Man. I actually like the regular War Machine design and silly name, and I think if Marvel had been a bit quicker on the draw and separated War Machine from Iron Man a bit more, he could've been a big hit in the 90's: he had shiny silver armor, he had guns, and he was named "War Machine." That's a recipe for success if I ever saw one! Instead, he's wearing this alien monstrosity and his book is a few months away from a quiet cancellation. The issue's big fight scene is against a complete unknown, in what feels like it's setting up a future subplot. It also feels like padding in this issue, since this steroid guy is a total non-entity, since it doesn't do anything except show off War Machine's hideous new armor. But I will say the book does flow pretty well. Stuff is continually happening, both individually to War Machine and in the broader sense of the crossover. 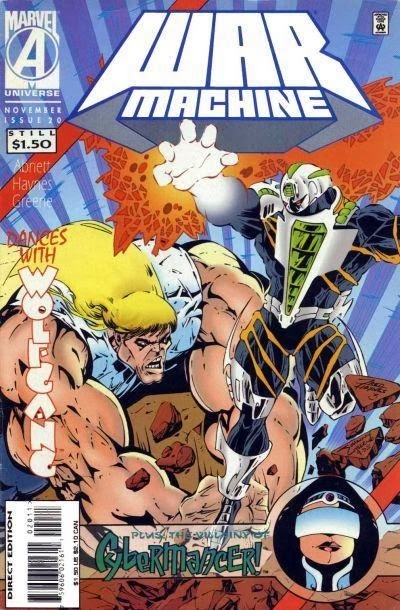 Another minor issue: the cover mentions the "villainy" of Cybermancer. I'm not sure exactly what she does, except follow orders from the team she's just joined. Fred Haynes's art is, for the lack of a better word, awful. It's 90's excess in all the worst ways. It feels like fill-in work for a Rob Liefeld issue of "Glory." Haynes draws ridiculous musculature, but still manages not to be as dynamic or interesting as Liefeld. He also can't draw human faces without turning them into gruesome monsters. The coloring and inking are not doing any favors to hide these flaws, and the result is a truly fugly comic book. As far as I know, this was Haynes's only regular art gig (he also did a War Machine/Force Works mini-series), as he's one of the many casualties of the bubble bursting. The biggest thing I can say is that despite the preceding paragraph, War Machine is still a better comic than this month's issue of "Iron Man." 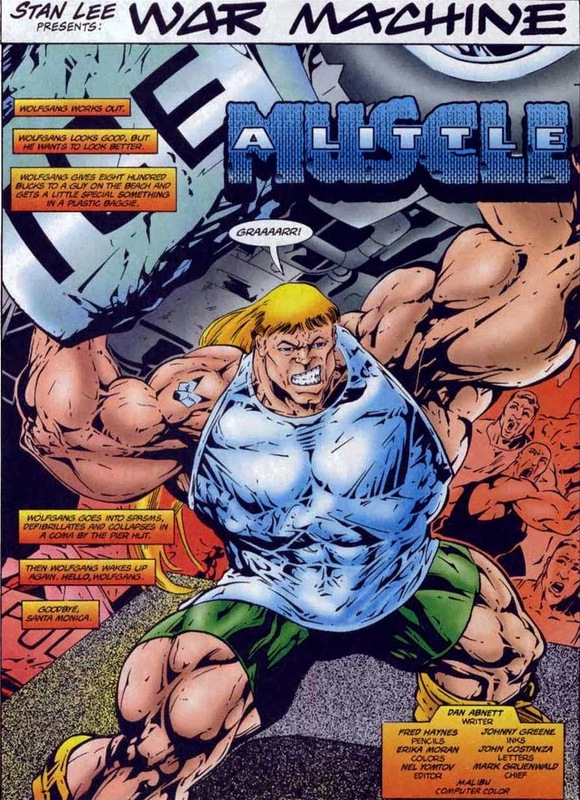 90's Fashion: "Wolfgang" the steroid freak wears a wifebeater t-shirt. 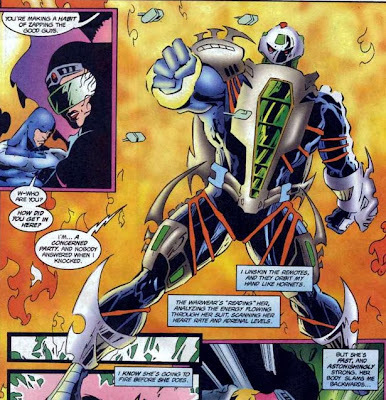 The Warwear armor sketches, as designed by Jim Calafiore, include asymmetrical cannon arms, sharp-edged boots, and a more bug-like appearance. Haynes's version of the armor adds mid-thigh pouch spikes and shoulder spikes (and a silly-looking nose). Do not stand next to War Machine in an elevator. I think the warwear is a fine design -- for a villain. It just doesn't work for War Machine. I suppose Marvel wanted to give him his own identity apart from being "the other Iron Man", but that should've been done via his personality, not a drastic change in visuals and powers. This is also my complaint about U.S. Agent, by the way -- personality-wise, he was about as far as Captain America as you can get, but Marvel still felt the need to differentiate him from Cap visually, so he got the ugly new costume and the energy shield. There's nothing wrong with a second guy in a Captain America-esque costume running around and carrying a Captain America-esque shield, if he's written well enough. And to go even further on the "clones of established characters" thing (literally in this case), I was one of the (apparently few) fans who wanted Spider-Man and the Scarlet Spider to exist regularly, at the same time, on an ongoing basis. Ben Reilly could've carried his own series, for a while at least, as the Scarlet Spider. Probably relocated to a different city, though. I know Marvel tried to do this recently using Kaine as the Scarlet Spider, but Ben was a much better character than Kaine (since, y'know, he was a good guy).